For Rock The Shot's January photo challenge, I chose this photo as my favorite that I took while I was away in Italy this summer. When I was a little girl I would climb up the stairs of my grandparents' home and would try to sit up on the roof, but since the wall was a bit too high I would just sit on the balcony and watch the sunset from there instead. 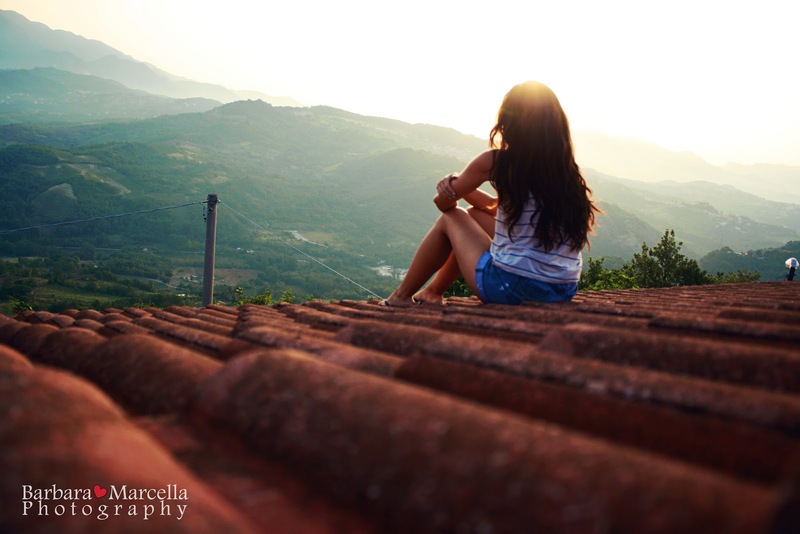 When I went back this summer, I decided to finally climb up on the roof and take the photograph I saw in my mind. And so I waited for the right time and sunset, climbed up and walked (slowly) back and forth on the terracotta tiles, rushing to get in and shoot as many photos as I could with my self-timer. This photograph now holds a memory of one of my favorite places at my grandparents' home in Italy, and sweeps me right back on that rooftop every time I take a look at it. Enjoy!